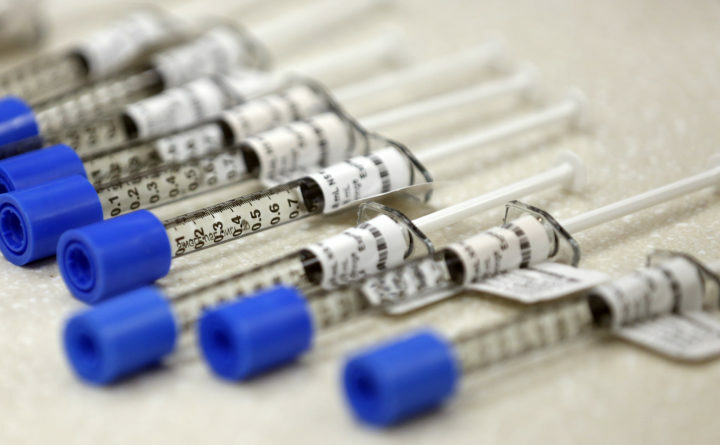 This AP file photo shows syringes of the opioid painkiller fentanyl in an inpatient pharmacy. Doctors in Maine have made the sharpest reductions in the country in the amount of fentanyl they prescribe. Fentanyl prescriptions from Maine physicians fell by almost 31 percent between 2016 and 2017. That’s according to a study from the University of New England, Husson University and Pennsylvania’s Geisinger Commonwealth School of Medicine. “It should be reserved for severe pain,” says study co-author, Kenneth McCall. McCall is a professor and residency director at the University of New England’s College of Pharmacy. He says Maine laws that put tighter controls on opioid prescriptions seem to be having an effect. “So I think what we’re seeing is the impact of public health policies in states like Maine that are moving us toward more appropriate prescribing of these potent opioid analgesics,” McCall says. Fentanyl is powerful synthetic opioid, 50 to 100 times more potent than morphine, and its use and misuse have become a factor in opioid overdose deaths across the country. Nationwide, fentanyl prescriptions were down by almost 18 percent over the study period. Prescriptions for all commonly prescribed opioids — morphine, hydrocodone, oxycodone and codeine — were down by at least 8 per cent.